Life as a Jane Doe: it's top two tuesday time! 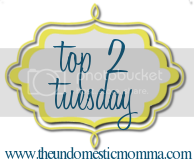 it's top two tuesday time! Link up with The Undomestic Momma to play along. I like simple dresses rather than over-the-top dresses. I think Jewel hit a homerun with this simple, one-shoulder strap gown. And... I love the pale yellow. Not to mention the fact that she is absolutely gorgeous... this dress is amazing. ﻿PS. If you don't know about Go Fug Yourself already... you should take a visit. The writers comment on celebrity outfit choices and they are hilarious. Just a suggestion. Loved Jewell's yellow dress, perfect for her!! Great picks! Jewel was so beautiful and glowing in that butter yellow gown, and Julianne worked that multicolor beauty! I love them! So cute! Your new blog design is cute! I don't think Julianne could possibly be any cuter. She is precious.